Stella Cadente's award-winning Persian lime olive oil is produced by crushing California Persian limes together with California Mission olives, resulting in an incredibly tangy but smooth Persian lime finish. 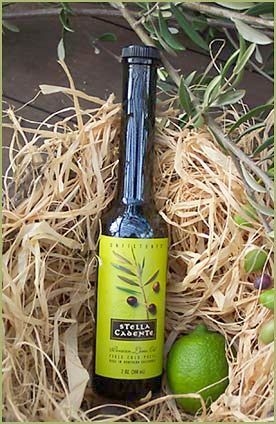 Stella Cadente Persian Lime olive oil has a myriad of uses from spicy Thai dishes, scallops, grilled Ahi tuna, grilled sweet corn, Mexican dishes, or just drizzled in the middle of an avocado. Please note that this is a "crushed" with lime olive oil and is not "infused." Most of the Citrus Oils on the market are "infused" and the taste profile is completely different & far less attractive to the taste buds. Stella Cadente follows tradition to insure that this award winning product, Persian Lime Olive Oil is made in a style consistent with old-fashioned methods.